You didn’t know? Well, it’s true. April 1, 2015 is officially the Second Annual Poison Ivy Day. You missed the first Annual PI Day? For goodness sake, you need to pay closer attention! 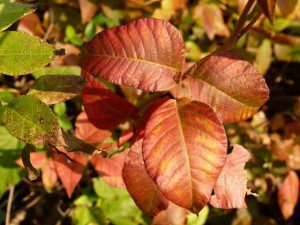 Poison ivy is a beautiful red color in fall. Virginia is the pioneer state on this one, but we are pretty sure others will be following our lead by next year. California already has a Annual Poison Oak Show each fall, but we have a ways to go before we can catch up to that. First relevant fact. Nothing gets more comments on our Facebook page than a post about poison ivy. People hate it. With Passion. Or . . . they love it. But here’s the second relevant fact; Toxicodendron radicans is a native plant with an important place in the ecology of our natural areas. You don’t need to have it your garden. I don’t recommend it for your garden. But don’t remove it, or disparage its place in our natural areas, either. A great many animals use it for a variety of purposes. The songbirds count on it as a reliable food source in winter when other things are scarce. Other animals eat the berries, too, and the leaves and twigs. Its blooms are a great nectar and pollen source for bees. It’s a protective sheltering spot. A mature river birch, Betula nigra, living happily with an equally old poison ivy vine. 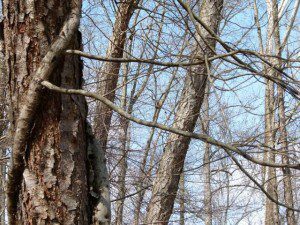 Those sturdy vines do not, repeat, do not, hurt our trees the way non-native invasive vines do. In a natural setting, the vine does not get too heavy for the tree, or shade out the sun, or injure the bark. Now, I know, from comments on Facebook, that there ARE instances where poison ivy has “taken over” in the way that an invasive plant can do, crowding other native plants. But those places are all in spots where humans had already altered the landscape so radically that the natural processes of checks and balances could not function. Don’t blame the plant. Poison ivy can form outreaching branches when it becomes mature. 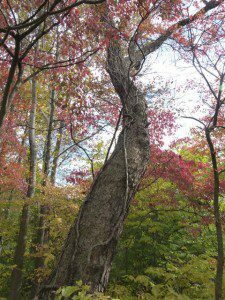 Thus it becomes ‘arborescent.’ We learned this on a walk recently with Rod Simmons, Natural Resources Specialist in Alexandria. 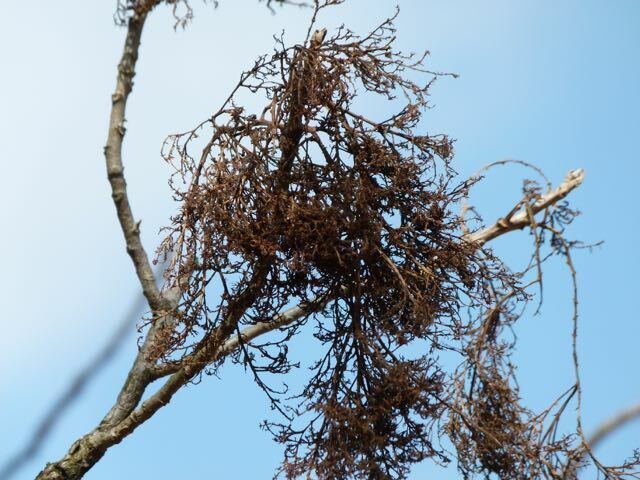 At the tips are the remains of last year’s flowering and fruiting. The wind was blowing and I was in the back of the group; I thought it sounded like he said it was called ‘poison ivy fluff,’ but this seems unlikely. Rod? For your amusement, I leave you with some rhymes pertaining to the ‘do not touch’ relationship we humans have with poison ivy. We appreciate its virtues…from a distance. Fingers of three, let it be. Berries white, a poisonous sight. Only a dope swings from a hairy rope. Red leaflets in spring, it’s a dangerous thing. Of all these, the last seems the biggest stretch. After all, in spring many emerging leaves are red. And for most plants, including poison ivy, that phase does not last long. Now admit it, they ARE pretty! And those hairy roots are not penetrating the bark to harm it the way Hedera helix, english ivy does. 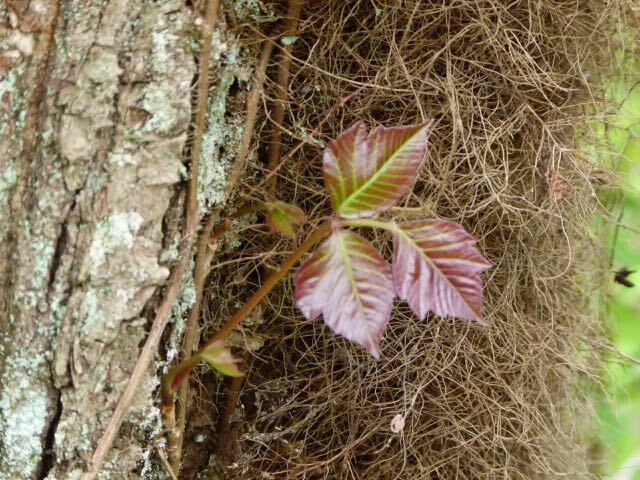 The very earliest leaves of poison ivy show shiny and red at first. Tell your friends to Celebrate! 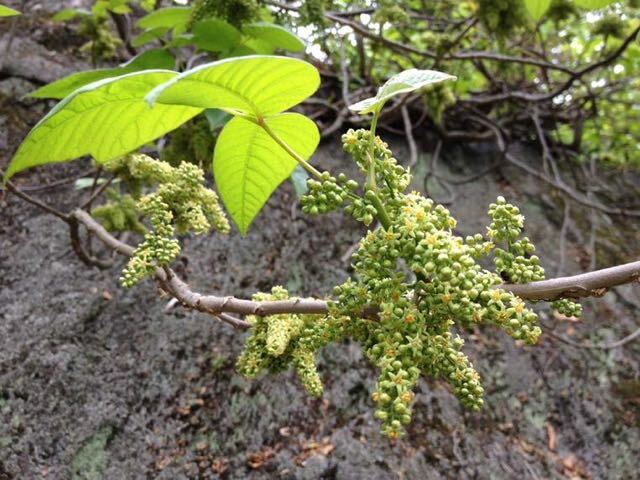 And Smithsonian botanist Mark Strong has already called for Poison Sumac Day next year. We don’t want Poison Ivy’s and Oak’s equally important yet also maligned tall, shrubby cousin to be left out of the annual celebratory ritual! Thanks for the very funny post! Indeed, who wouldn’t?! I loved that one, too. Sticks with you! Glad to see the positive postings for this most valuable native plant. One important point to make is that poison ivy berries are a major food source for our wintering and migrating birds. Clearly, it should be handled with appropriate care in the right settings and not treated as a plant to be destroyed. Very glad to hear of your support for this useful vine! Great post, Sue. I was out today scouting for my upcoming Master Naturalist field trip and found it as it always is at this time of year: a hairy vine or little stems poking up with just a hint of the tiny leaves showing at the top. My favorite PI story, a true one, took place during a wildflower class I was taking with Marion Blois Lobstein in Manassas, many years ago. One of the students in the class kept boasting about how he didn’t get PI…until one day he missed class because he had a massively bad case of PI he’d gotten from pulling vines out of trees on his property. If he hadn’t been so boastful I’d have felt sorry for him, but it was hard not to snicker a bit at his plight after all that boasting. Isn’t there some saying about pride going before a fall? Ruth, thanks for your comment and story! Those vines will definitely fool you – when they are tangled in brush and no leaves are present you have to remember they may look innocent, but the sap will have its revenge! I’ve cleared many a space only to discover afterward that the naked vines were PI.